Not only do caravan and motorhome owners like to be hooked up to the electrics – our latest poll results show that they also like to stay hooked to the internet! 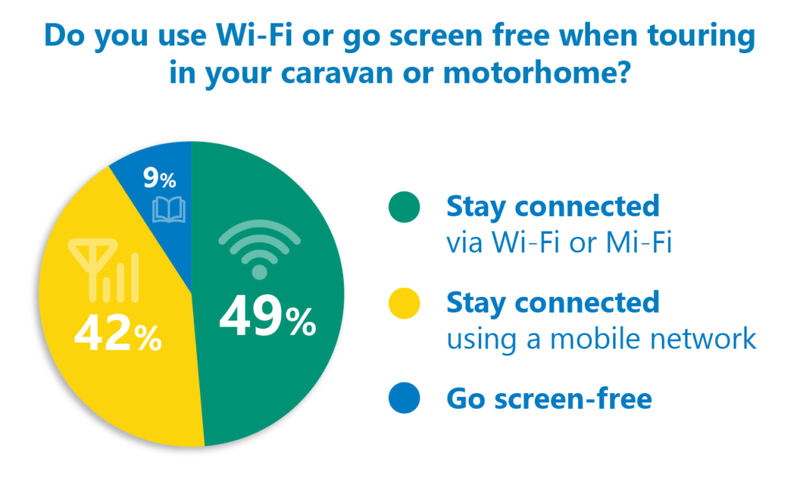 Last month we asked the caravanning and motorhoming community if they like to keep connected to the internet via Wi-Fi, Mi-Fi or their mobile network, or if they chose to go screen-free. With nearly six hundred votes, there was an overwhelming majority, with 91 per cent of voters stating that they liked to keep connected when touring in their caravan or motorhome. As we shared our gear guide on Wi-Fi when touring we also found out that lots of people use devices to boost their internet connection so they can be online as much as possible. Forty nine per cent of voters stay connected via their campsite’s Wi-Fi or by using a Mi-Fi device and 42 per cent use their mobile phone network. Only nine per cent choose to take a break from the online world and go completely screen-free. Many voters commented that they would like to see free Wi-Fi on campsites, similar to many pubs and restaurants. Jon White, finds it a huge pleasure to go to screen-free if he’s away for a few days as his job involves using a screen a lot of the time. “However, it’s still useful to be able to stay in touch with family and friends on longer trips, so I guess it all depends on how long you are away,” he added. Thanks to everyone who voted – from the campsite, on your travels or at home! Look out for our latest poll on the blog. I use a dongle from Vodafone. It cost £25 pre-loaded with 2 Gigabyte of data. Using Pay As You Go I can top up with £20 for 5 Gig which is adequate for me. I refuse to pay exorbitant site wi fi fees – especially Caravan Club. In the past we have used wi fi in shopping centres, pubs etc.